As you read this, I’ll be offline celebrating the holiday of Sukkot. It may be a more minor holiday than Rosh Hashana or Yom Kippur, but I like celebrating these holidays. Now, I’m not Orthodox. I do things like take photos, watch TV and the like. One thing I don’t do, though, is use my phone or computer. I use the holiday as time off from anything work-related (which includes all computers as I program websites for a living and phones as I could otherwise take calls from work defeating the purpose of being “off”). Instead, I spend the time with my family. The forced time offline means that I interact with my family more. 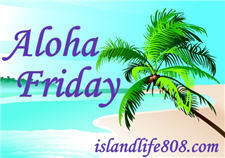 My Aloha Friday question for today is: Do you regularly take vacations from social media/computers? I have a small business that relies heavily on social media so I haven’t had a vacation from it (other than Sundays) for about a year. I am planning to go computer-free the week after Christmas though. Good for you! Happy Sukkah! Not really sure what it is, other than a Jewish holiday, but I hope you enjoy your time offline. I don’t “regularly” but I really should. My husband and I do shut off technology during dinner time, but that’s about it. On days that my husband is off from work, I usually take a break from the computer. Not “regularly”…but on occasion, yes. I always fast from media from Good Friday through Easter Sunday, and it really does “set apart” that time and make it clearer in my mind that this time is special. I do the same for Christmas (Christmas Eve and Christmas day…though I’m less strict with that…I’ll go on to post pictures and such and say “Merry Christmas” to friends on facebook, and we might watch a movie or old home videos, but I stay away from my usual blogging and anything commercial I do online. Just doesn’t seem fitting, and it does help me focus more on family. Gale recently posted..Stickers on Sale! I try to limit my time on the computer and tech stuff to the weekdays and leave the weekend to family time! Nope, I spend as much or as little time on the computer as I want. I haven’t taken a vacation from it since I got my first one many many years ago. I should. We were stuck in traffic on a mountain top without service for a couple of hours last week and it was pure magic. No, but I need to. I probably would take longer breaks if I didn’t have a smart phone. That phone just makes it too easy to stay connected.